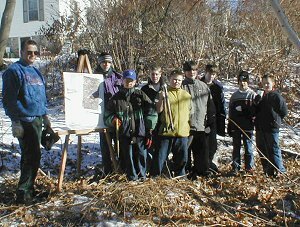 Saturday December 9, 2000: Scoutmaster JR Magee and Boy Scout Troop 41 of Marlborough volunteered to help cleanup the trail. Site of the cleanup was the track from the corner of Highland and Lincoln Street west, parallel to Jefferson Street. Thanks to the Scouts for a morning of hard work opening up this historic line to the first Fitchburg RR freight depot in Marlborough. On Monday, Nov 20, the Hudson Town meeting voted to approve Warrant Article 4 which requested an appropriation of $50,000. This money will provide the final portion of funding needed to complete the design of the trail from the Main Street Bridge to Wilkins Street / Rte. 62 and to acquire and design additional right of way needed for a trail head and parking lot. Thanks to all the ARRT supporters who got out the vote! 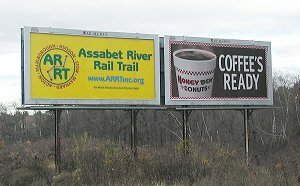 November 13th saw the posting of the first ARRT notice on the AK Media billboard in Hudson. It is located on Main Street, about one mile east of downtown Hudson. This may be the first trail project with its own billboard! Congratulations to Michelle Ciccolo, Carol Jonietz and Joey MacAloney for completing this project and just in time for the November Hudson Town Meeting! Construction Update On November 15th the first paving began on the ARRT! 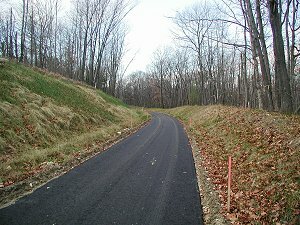 Although it won't be opened until next Spring, a 3/4 mile section in Marlborough got its base layer of asphalt.